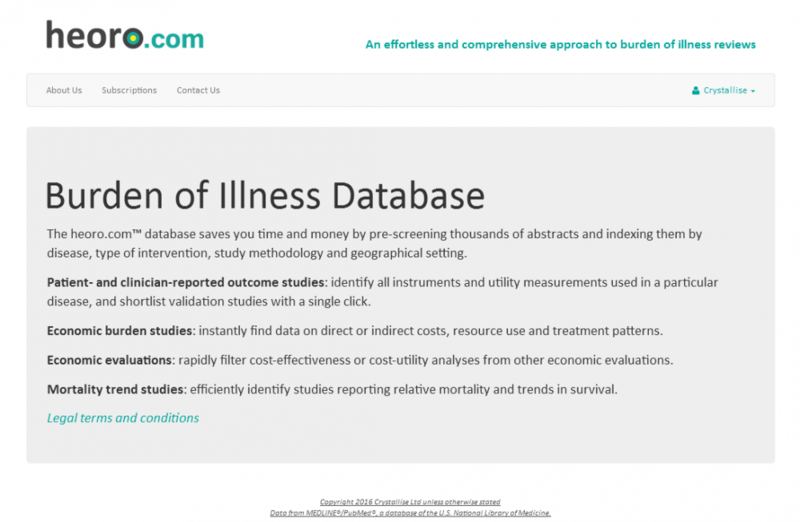 Heoro.com™ is a database of pre-screened studies relevant to the humanistic and economic burden of disease, indexed using our customised semantic ontologies for disease, interventions, patient-reported outcome tools, economic burden and model types and geographical settings. We’ve taken the time to check and index the studies by topic so you can save time and money in finding the data you need to develop your model, patient reported outcome (PRO) instrument or dossier. Use the Contact us button to send us comments, questions or feedback about the site. Click on About Us for details of the search strategy and to read about how we developed the site. Once logged in, click on your organisation name to access the dashboard. Our disease ontology has more than 4,700 entries plus synonyms to make it easier to find the condition you need to research. “Critical illness” and “Acute disease” for medical emergencies and life-threatening conditions. “End of life” for studies on palliative or terminal care. Conditions not typically thought of as diseases (for example, “pregnancy, normal”, “menopause, normal”). “Fertility” (for studies on contraception or termination of pregnancy). Specific age groups (“Children or adolescents”, “Elderly” for studies where being in this age group was an inclusion criterion). Specific ethnic groups (White, Black, Hispanic, Asian, indigenous, other ethnic groups, where being in this ethnic group was an inclusion criterion for the study). “General population” where the study participants do not have any disease or condition. Indexing is based only on information in the study title, abstract and MeSH terms. All studies are indexed by medically-qualified staff according to the conditions and comorbidities that were inclusion criteria for the study population. Abstracts are indexed against our semantic ontology to match the conditions and comorbidities that were inclusion criteria for the study population. Complications of the main diseases or adverse events associated with treatments have not been used as indexing terms. Your search is therefore specific to the disease or problem of interest. You won’t have to wade through multiple irrelevant abstracts to find what you’re looking for. Theoretical studies on modelling approaches. Studies evaluating service or healthcare design and organisational structures. Want to remove a search term? Just click on the X beside it. Use the Boolean And/Or/Not options to find or exclude comorbidities. Can’t find what you’re looking for? Try the Free text search. The Study Type menu panel appears when you select a disease. Search for “Any disease” to use this panel where no specific disease applies. Economic analyses and modelling, including cost-effectiveness, cost-utility and cost-benefit studies. Studies reporting on mortality trends for a disease or researching the impact of treatments on mortality. Comprehensive searches: Heoro.com searches for all selected study types using a Boolean “or” approach. 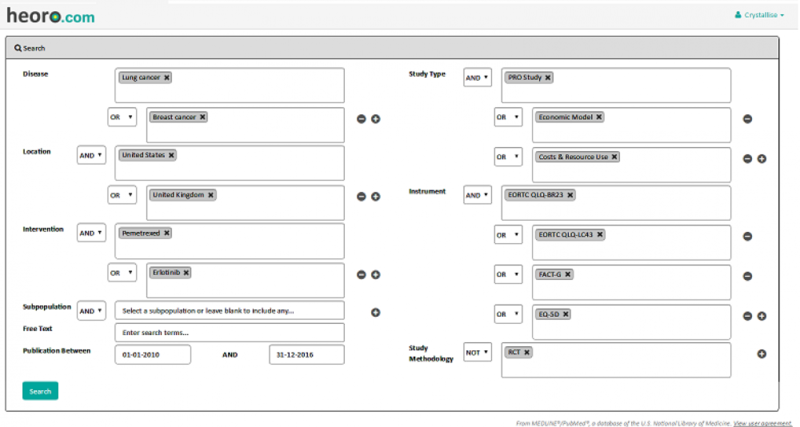 Heoro.com allows you to search for studies using a specific PRO instrument or a particular type of economic evaluation. Humanistic burden: Our PRO instrument ontology includes more than 4,000 tools, indexed hierarchically by disease or population context. Pick the tools you want to study from the menu, or leave the box blank to see all studies. Economic burden: Cost and resource use studies are indexed according to whether they report direct healthcare costs, indirect costs from a societal perspective or productivity data, resource use, treatment patterns or adherence. Economic evaluations: Studies are indexed according to whether they report cost-effectiveness, cost-utility or cost-benefit analyses, or other types of economic modelling. Utility values: Studies are indexed to this category if they report the use of a tool that can be used to measure utilities. “Preventive services” such as “Screening” or “Surveillance” for disease, and “Secondary prevention” interventions. “Tests for disease” and other diagnostic approaches. “Service design” to improve health or deliver more cost-effective management, including integrated disease management or intensive control. Computer and mobile interventions, including text messaging reminders, internet self-care programs and telemedicine. Interventions designed to improve adherence to treatment or uptake of preventive services. “Nurse-led” or “pharmacist-led” services, or ”Community-based services”. Complementary therapies including “Medicine, traditional Chinese”. Heoro.com indexes studies according to the geographical setting or jurisdiction in which the study occurred, at a national or international level. Specific searches: please note, if no location is specified in the title or abstract, the study is indexed to the authors’ location. This may differ from the actual setting, but will help you focus on studies that are most likely to include participants from the country of interest. Systematic reviews are indexed as having an “International” base. Select the study publication date of interest. Heoro.com contains over 100,000 relevant abstracts published since 2005, of which more than 13,000 have currently been checked by human experts. Specific searching:Heoro.com indexes all studies that are Randomised Controlled Trials (RCTs) or systematic reviews, so you can select just that type of study. Abstracts reporting protocols of studies are also included in the database, so users can see the methodological approaches being used across the market and identify studies with as yet unpublished results. Studies identified by the search are presented in reverse date order, with human moderated studies at the top of the list, followed by studies likely to meet your criteria based on our software classifier indexing. Comprehensive and specific: Our automated indexing uses trained classifiers and text analysis tools, and has more than 95% accuracy for indexing humanistic and economic burden study types. When you click the Search button, heoro.com will display the studies that meet your search criteria. You can refine your search if there are too many or too few relevant studies. You can also select the studies that are most relevant and useful for your research by clicking on the box at the top left of each relevant citation. You can also click through to see the citation on the PubMed NCBI site, to discover whether you can download the PDF of the full text paper via the publisher’s site.